The knee is a relatively unstable joint. It has long bones above and below the joint. There is not much muscle over the joint to help protect the joint. When that movement becomes disorganised, the loading on the ligaments of the knee is not even. 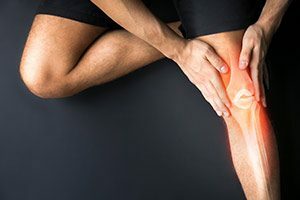 The abnormal loading causes ligament strain which is often accompanied by pain, discomfort and swelling. The osteopath will balance the tone of those muscles and ligaments associated with the knee joint. The loading should become more even as a result. Better more balanced function means less pain. A well-balanced knee is less likely to damage the knee cartilage during sport.